FibroScan is a modern non-invasive device for determining the degree of fibrosis and staging hepatopathy. FibroScan (elastography) is a recently introduced technology that allows quantification of liver fibrosis based on the analysis of elastic shock waves travel propagation in liver tissue. 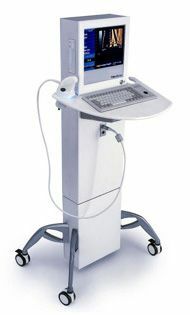 What are the advantages FibroScan ? Establishing liver fibrosis with FibroScan technology is painless and noninvasive, is characterized by simplicity, rapidity, reproducibility. The result is immediately available for the pacient. The procedure can be performed whenever necessary, especially for evaluation of treatment. Unlike FibroScan, liver biopsy is an invasive method, which may have inherent limitations and contraindications. Non-invasive techniques appear as an alternative to liver biopsy, with a performance that tends to be close to that of morphological examination. Their recomandation include the delineation of mild fibrosis of the severe ones, with diagnosis purposes or for treatment recruitment, substituting the morphological examination. How does FibroScan works ? The operating principle of the FibroScan device is based on histological outcome studies : the more harder is the liver, the higher the degree of the fibrosis. Liver tissue elasticity can be used to assess liver fibrosis stage. To determine it, the device emits a shock wave starting from the thoracic wall and measure its speed with a beam of ultrasound. Measuring liver elasticity is actually the average of multiple measurements at the same point of impact. Only waves whose speed is constant in liver parenchyma are validated by the device, which cause elimination of artefacts. The volume explored is at least 100 times higher than tissue sample obtained by liver biopsy, an important point being recognition of the heterogeneity distribution of liver fibrosis. How to make FibroScan test ? This test can be performed both in the recommendation of a medical specialist, and the patient's request based on a prior telephone appointment with at least 24 hours before the chosen day. Maneuver is painless, requires no prior preparing, and the result is issued on the spot. For an accurate diagnosis is recommended to combine FibroScan with the FibroTest - Actitest tests set.